Perfect For Extending Your Keyboard! 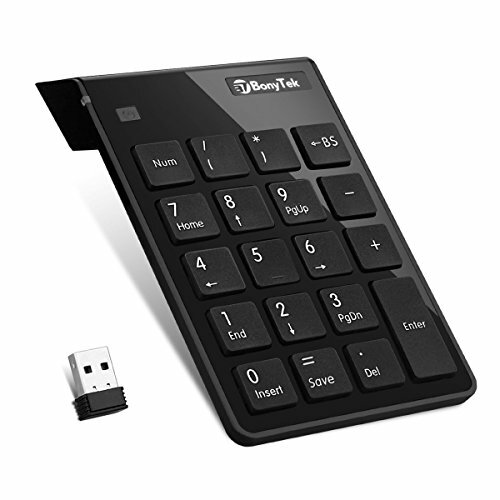 ★ BonyTek 19 Keys Wireless Numeric Keypad is the perfect accessory to complete your workspace. Featuring a full keypad with Number Lock, the Wireless Numeric Keypad is a great wireless solution for extending your existing keyboard. ★ Besides accountant, Every notebook or laptop will become dependent on the numeric keypad after one try! Use it, you will find your work efficiency and productivity improved greatly! ◆ Blue light ON -- Numeric Part works; Blue light OFF -- Function keys works. ◆ Press the power button 5 seconds to power off; Press again 2 seconds to power on. ★Numeric key mode, "Enter" shows the results of calculation, "=" can be used for simple function calculation. ★Function key mode, "Save" shortcut keys can save the editing data in time, you can enter these two "bracket" keys to facilitate mathematical calculation. ★ Simply plug the USB receiver into an available USB port of your computer and it's ready to use, no driver needed. ★ Ergonomic design, thin and compact keypad in a laptop bag or briefcase to efficiently enter data wherever you go. ★ The blue LED indicator on top left corner indicates whether it's ready for data entry or not. ★ Works with PC and desktop computers that have Windows 2000, XP, Vista, ME, 7, 8 10 Operating Systems. ★ BonyTek Upgraded Version Keypad: Consisted of 19 full-size keypads and concave keys including NumLock / BackSpace / Enter / Home / End / Insert / Save / Delete / PgUp / PgDn. Compared to our ordinary Version keypad, it adds a "=" / "Save" key and bracket key function. Enables comfy input and improved productivity, Great Accessory for Small Laptops Without A Separate Keypad. ★ Easy to Use: Built-in Receiver Storage, 2.4 GHz Wireless USB Receiver, Plug and Play. USB Wireless Connection, Signal Transmission Stability, Up to 33FT Working Range. Compact and Convenient Wireless Keypad, Space Saving design, Easy to Carry. ★ LED Indicator: The Blue LED indicator on Top Left Corner indicates Whether it's ready for data entry or not, Press Num Lock button to Shift Numbers and Function Inputting. ★ Power Supply: Rubber Non-slip Pads Design at the Bottom, More Secure Stable. Hibernation Mode Enabled Automatically, No Power Button Needed; Use 1 * AAA Battery【 Note: Battery Not Include】. ★ System Requirements: Works with Laptop Notebook Desktop PC Computer Compatible with Windows XP, Vista, ME, 7, 8 2000 operating systems ＆ Mac OS X.【NOTE: This numeric keypad is not fully compatible with Mac OS X. Function keys do not work, while numeric part works fine.】. If you have any questions about this product by BonyTek, contact us by completing and submitting the form below. If you are looking for a specif part number, please include it with your message.